Pure omega-3 oil from 100% Arctic wild fish with cold-pressed, high quality organic olive oil and vitamin D3 – added fresh lemon flavour. 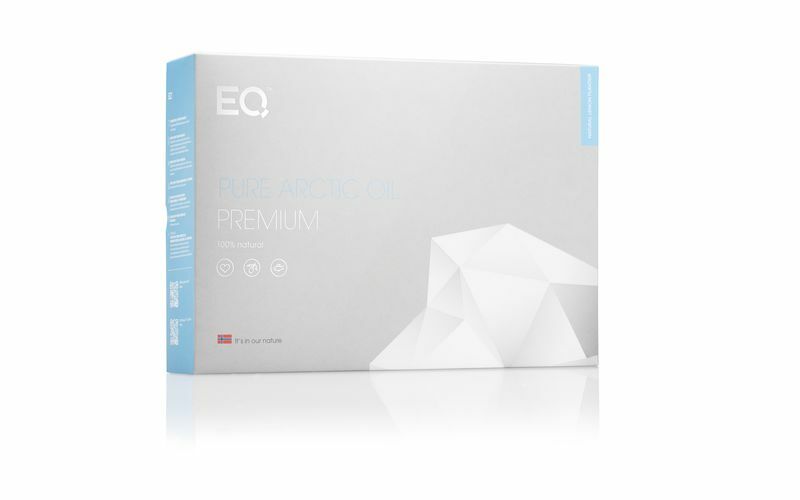 EQ Pure Arctic Oil Premium also entitles you 25% discount on all other *single products (not subscriptions) – every month! Results show that nearly all who have used EQ Pure Arctic Oil for at least 120 days have achieved an improved fatty acid balance. EQ Pure Arctic Oil contains pure omega-3 oil from cod, fished from the nutritious, Arctic waters off the Norwegian coast. 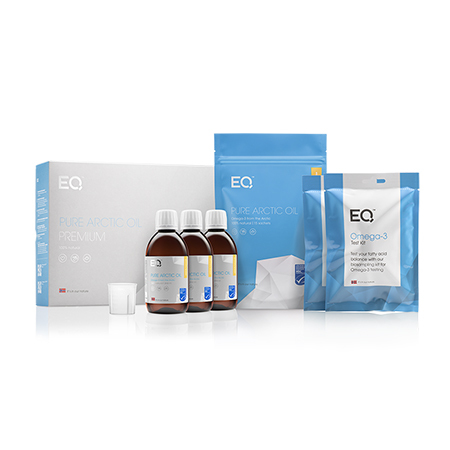 We recommend double dosage the first 2 months – you will therefore receive a box with 3 bottles of EQ Pure Arctic Oil: 2 bottles the first month, then the 3rd bottle so you get started the second month until you receive your monthly auto order of 1 bottle of EQ Pure Arctic Oil for only EUR 35 per month. A measuring utensil is included to ensure the correct recommended dosage (PS! The measuring utensil is not dishwasher proof). This 6 mth. 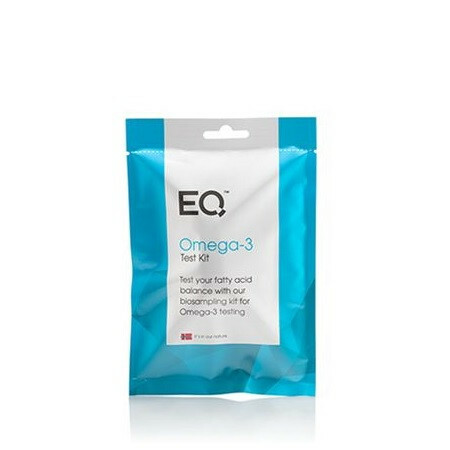 subscription contains 1 EQ Omega-3 Test (delivered with your 5th subscription month). Your results can be securely accessed on omegaratiotest.com/en after 15 – 20 business days. 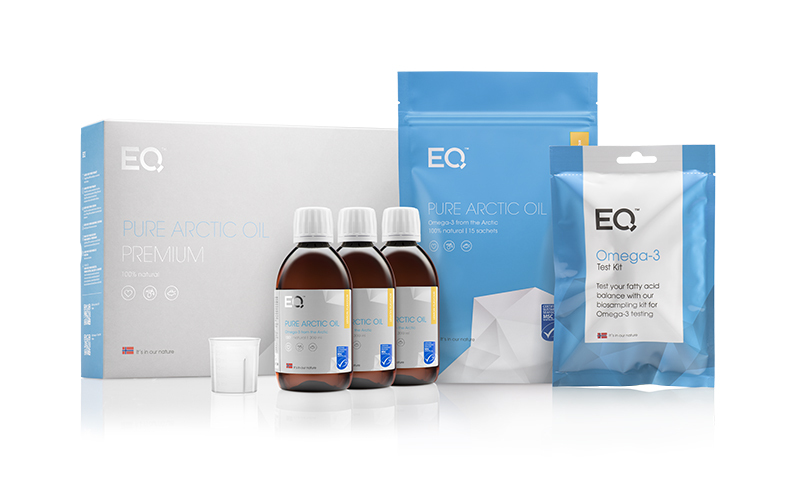 We have also added 15 EQ Pure Arctic Oil 10 ml samples – perfect for when you are traveling or to give to your friends and family. Did you know that if 3 of your friends or family members order the same product as you – you will receive your product FOR FREE! You only pay shipping/handling. NOTE: This is a 6 months binding subscription. 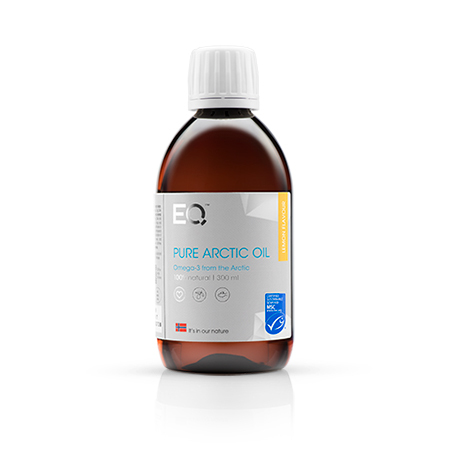 Starting month 2 you will receive 1 bottle of our EQ Pure Arctic Oil for only 35 EUR + shipping monthly. 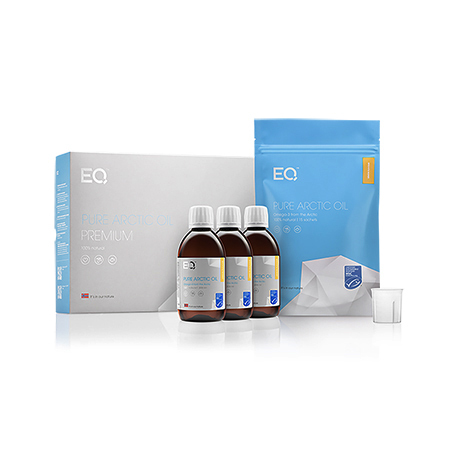 The EQ Omega-3 ratio Test will be send to you together with your 5th monthly order. If the subscription is not terminated prior month 6, it will continue as a monthly auto-order. Fish Oil (EPA and DHA), Cold-Pressed Organic Olive Oil, Flavour (Natural Lemon), Vitamin D3, Antioxidant Mix: Natural Rosemary extract, Vitamin E (Tocopherol rich extract). Low Totox values are considered a sign of a good-quality Omega-3 oil. Totox is a calculated value of “oxidation products” in the relevant omega-3-oil values and is the sum of 2x PV + AV. The Totox value in the fish oil we use in our EQ Pure Arctic Oil is lower, and thus better than the lowest value measured in “TV2 hjelper deg”, a Norwegian consumer guide program, when testing Norwegian omega-3 products in 2014. The lowest value measured in the program was 9,3. The values in the omega-3 oil Eqology uses varies slightly depending on the batch but is somewhere between 4 and 8. Fatty acids are highly important in ensuring that all the body’s functions, including the brain, muscles, circulatory and respiratory systems and skin work as they should. Fatty acids are divided into omega-3, -6 and -9. Omega-3 and -6 are essential fatty acids, which means that we are not able to produce them on our own, but have to get them through our diet or as a supplement. These fatty acids are necessary for the development of the brain, the function of the immune system and the regulation of blood pressure, and it is highly important to get them daily to ensure optimal development. Before the industrial revolution the Western diet had about as much omega-3 as omega-6. The last 40-50 years have, however, seen big changes in what we eat. Today we consume a lot of processed foods and vegetable oils from i.a. soy, sunflower and corn, which have up to 80% omega-6 and little or no omega-3. There is also a notable amount of omega-6 in feed given to the animals that are the source of the animal products we consume – the same can be true for feed given to farmed fish. An imbalance with a large majority of omega-6 fatty acids can be a big problem to your health. Unfortunately this is the case for most of us, without us even knowing it. Today the ratio between omega-6 and omega-3 fatty acids in the typical Western diet is between 10:1 and 20:1. This means that we are getting up to 20 times more omega-6 than we are omega-3. The recommended ratio is under 5:1. During the last decade it has become general knowledge that long-lasting inflammations are a driving factor in several chronic diseases, i.a. cardiovascular diseases, type 2 diabetes and obesity. A ratio higher than 5:1 increases the length and severity of inflammatory reactions. Balanced omega-6 and omega-3 could be one of the keys to better health and to reducing chronic illnesses. We also added omega-9 fatty acids and high levels of polyphenol antioxidants from a unique cold-pressed, high-quality olive oil that has been awarded the NYIOOC GOLD AWARD. Omega-9 contributes to maintaining a healthy cardiovascular system and to balancing blood sugar levels. The solution to preventing inflammatory responses and cardiovascular disease is to increase the intake of high-quality omega-3 and omega-9, instead of merely reducing the intake of omega-6. Dietary supplements do not substitute a healthy and varied diet. Produced in accordance with GMP standards. When ordering EQ Pure Arctic Oil PLUS with tests, you can ask for your money refunded if your ratio is better than 3:1 after your first EQ Ratio Test. To claim this guarantee, return the unopened bottle and the one you have opened and started using – and we will then cancel your 6 month subscription and refund the amount. Valid for 30 days. Recommended daily dose is 0,15 ml per 1 kg of body weight. 1 ml contains a total of 118 mg DHA and EPA. Dietary supplements should not be used as a substitute for a balanced diet. We recommend a double dose the first month. Please consult your doctor if you are on anticoagulants, pregnant or giving the product to a child under 1 year of age. Unopened bottles should be stored in a dark, dry and cool place or in the refrigerator. Opened bottles should be refrigerated and used within 90 days. When storing below 4º C the product might become opaque due to the olive oil. After a few minutes in room temperature it will again become clear. Store out of the reach of children. With the help of a simple self-administered device you will quickly get an answer to your omega-6 and omega-3 ratio and omega-3 index. The blood sample on the filter paper is extracted and analysed according to international standards for omega fatty acid testing by Vitas AS Laboratory in Oslo, Norway. Your results can be securely accessed on omegaratiotest.com/en after 15 – 20 business days. AUTO ORDER: An auto order is a monthly shipment option, where you have the flexibility to choose whenever you want your orders delivered. An example: if you choose period 3 as your delivery, we will deduct the payment from your account between the 16th and the 23rd of every month. The order will be sent at the beginning of each delivery period. If you want to change your auto order, you can do so before 11:59 p.m. the day before your selected period starts (in this case before 23:59 on the 15th). ADDITIONAL ORDER: An additional order to your monthly auto order. The products will be sent as part of your auto order, so you don’t pay additional delivery fees. DIRECT ORDER: An order that will be sent separately and in addition to your monthly auto order. The shipping and handling fee of 6,90 € will be added to this order.